Everyone gets nervous when their child has a fever. However, fever is not dangerous. The CAUSE of the fever is what is important. There are many myths surrounding fever. 1. Fever helps the body fight infection. Fever helps slow growth of bacteria and viruses. It also enhances the immune fighting cells in the blood. 2. A high fever does not necessarily mean that there is a serious disease. Many viral illnesses can cause very high fevers. While these fevers might be high, they will go away without any help in three to five days. 3. Fevers do not cause brain damage. Again, fever is a normal physiologic response. The only time that fever is dangerous is when it is from heat stroke or hyperthermia. Symptoms of heat stroke are red hot dry skin with no sweating and confusion. Infections and illnesses that cause fever do not cause heat stroke and are not dangerous. It is true that a small percent of children who get a fever will have a febrile seizure. Febrile seizures occur in about 4% of kids. They can be very scary to watch but they do not cause brain damage. 4. Medicines to lower fever are not expected to bring the temperature down to normal. Ibuprofen and acetaminophen are often used to bring down fever in children. However, these medicines will only help the child feel better for a short time. When the medicine wears off, the fever will return. Your child will continue to have fever for as long as the illness lasts (usually 3-5 days). Also, these medicines will lower the fever but they are not expected to bring the temperature back to normal. It is expected and helpful to have some fever while your child is sick. Of course you want your child to be comfortable and you do not want your child to get dehydrated from a high fever but remember that the fever is helping your body fight infection. Also when your child is sick, he or she should be resting. If you bring the temperature back down to normal with medicine than he will want to run around and play. The goal in using medicine for fever control is to keep your child comfortable while his body is fighting the illness. 5. Fevers will not continue to rise without treatment. The brain has a “set point” temperature that it will reach and then start to come down, even without medicine. 6. Medicines to bring down fever will not prevent a febrile seizure. One in twenty five children will have a febrile seizure. It is impossible to predict and it is impossible to prevent. Remember that while they are scary, they are not dangerous. Do not use medicine to try and prevent a seizure. Medicine for fever should only be used to keep your child comfortable. 7. It is most important to determine the cause of your child’s fever. Fever is just a symptom. If the fever is from strep throat or an ear infection then he might need antibiotics. If the fever is from a virus, then it will need to “run its course”. 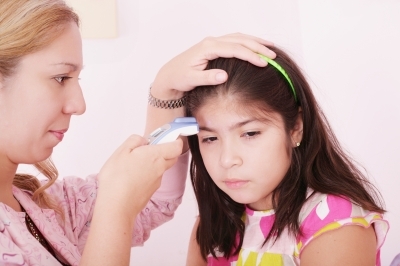 You should bring your child to the doctor to help determine the cause of the fever. Once you know the cause, you can relax.